My kids love to make crafts. My oldest will spend her days off from school asking to make crafts together, and I love the time we spend together. There is something about sitting together, snipping paper, and creating as we chat and snack, that builds memories. And when we craft together, we love to have a little snack, too. So, when I put together a Chocolate Card Making Party, she was ecstatic! I told my daughter about our Card Making Party and how it would be crafting with chocolate and she wanted to invite all of her friends. This crafting party would be the perfect way to spend time with friends and family before the holidays, while creating cards that are perfect for gift-giving. 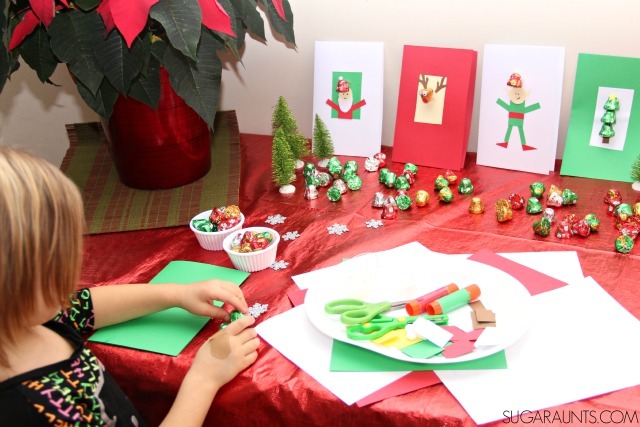 Check out these Christmas Fine Motor Activities for more creative ways to work on fine motor skills and address development of skills this Christmas season. 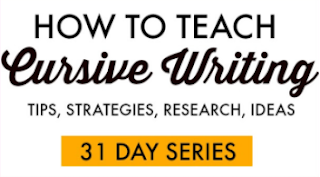 During the hectic winter months, it can be hard to get everything crossed off the to-do list. 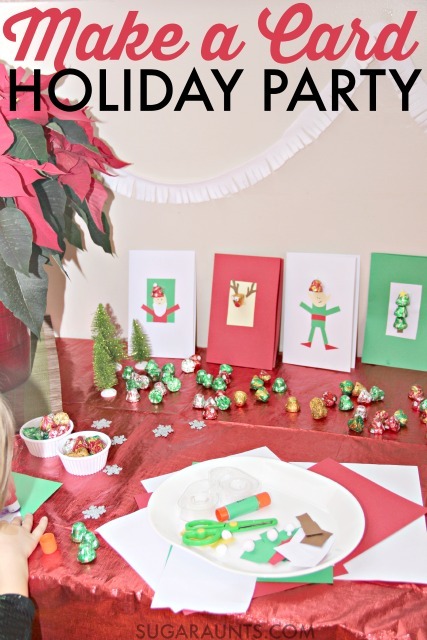 This party is a great way to get-together with friends in a play date atmosphere while creating cards for loved ones. Each year, we create Christmas cards for Grandparents, neighbors, teachers, coaches, bus drivers, and other helpers in our lives. Get your friends together to craft holiday cards while sharing a meal with this Card Making Party idea. When a holiday get-together involves food and snacks that you can feel good about serving your family, it is such a relief. The items we used at our card making party make it easy to throw together a party with quality favorites that will please any crowd. This holiday Card Making Party was a breeze to set up. 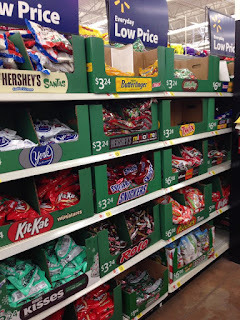 I was able to grab all of the party decorations, supplies, and food at Walmart while shopping with my littlest girls. The NESTLÉ® BUTTERFINGER® Jingle Bells and NESTLÉ® CRUNCH® Jingles were in the seasonal Christmas aisle and the NESTLÉ® CARNATION® Famous Fudge Kit was in the seasonal baking section. I found all of the other items in the craft and party sections of the store. A one stop shopping trip when you are shopping with kids in tow is important to any busy mama! I kind of love decorating for parties. This Card Making Party was no exception! 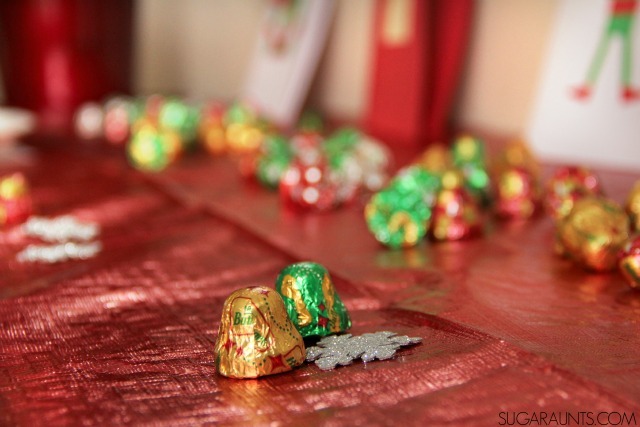 I used a shiny red tablecloth, and all of the items needed to create holiday cards. 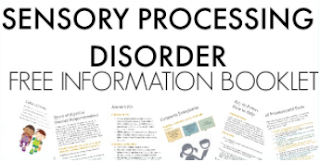 I wanted the card making station to be central in our party so all of the paper, tape, glue, scissors, and card embellishments were right on the table. 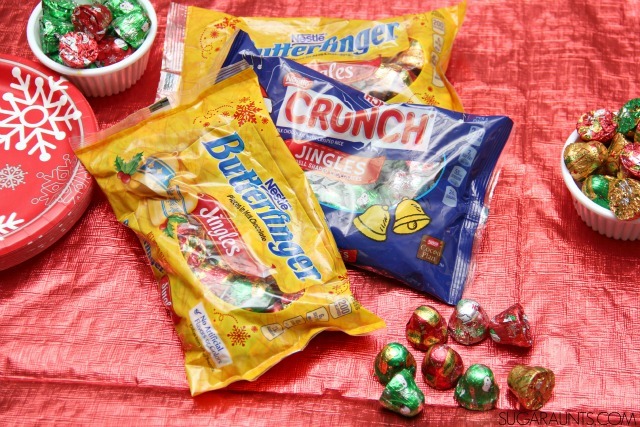 Scatter NESTLÉ® BUTTERFINGER® Jingle Bells and NESTLÉ® CRUNCH® Jingles all over the table. 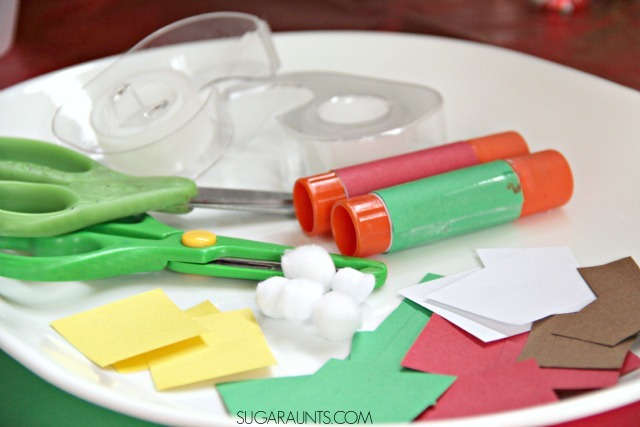 Your guests will need them in their card crafts (and for snacking!) I also added them to festive little bowls on the party table. We had Christmas decor like poinsettias, a fun fleece garland, glittery snowflakes, and glittery Christmas trees. I have to tell you how easy that simple, yet stunning felt garland was to make: Simply cut a long strand fleece about 3 inches wide and 9 feet long. Then, snip into one edge of the fleece strip, leaving a 1/2 inch border. 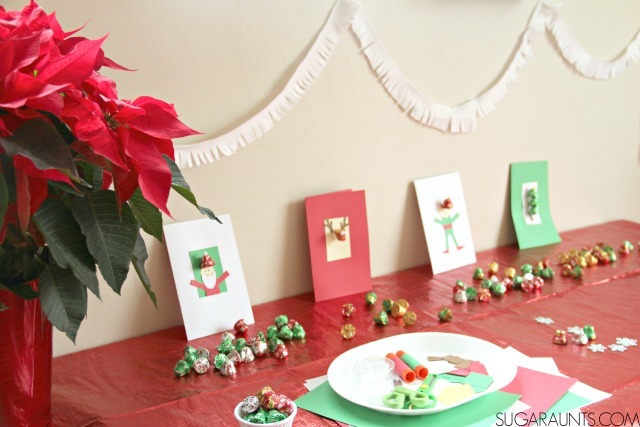 A no-sew party decoration like this makes holiday decorating easy. And holiday extravaganzas require easy steps! For your card making party, you'll need card making supplies. In the craft section of Walmart, grab red, green, and white card stock, and other colors like beige and brown for accents. We used a handful of white crafting pom poms, too. 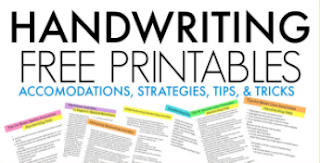 Other items you'll need are clear tape, glue, markers, stamps, ribbons, and glitter. You'll need lots of NESTLÉ® BUTTERFINGER® Jingle Bells and NESTLÉ® CRUNCH® Jingles, too. Before your party, make examples of the Christmas cards. You can prop them up on the party table for added decoration and to use as a model for card makers. Of course, party-goers are welcome to create any festive cards they like, but we thought these ideas were fun and wanted to share them with you! 4 red thin rectangles for Santa's arms and legs. Build the Santa on a green card stock rectangle. Use a NESTLÉ® BUTTERFINGER® Jingle Bells or NESTLÉ® CRUNCH® Jingles chocolate bell to make Santa's hat. 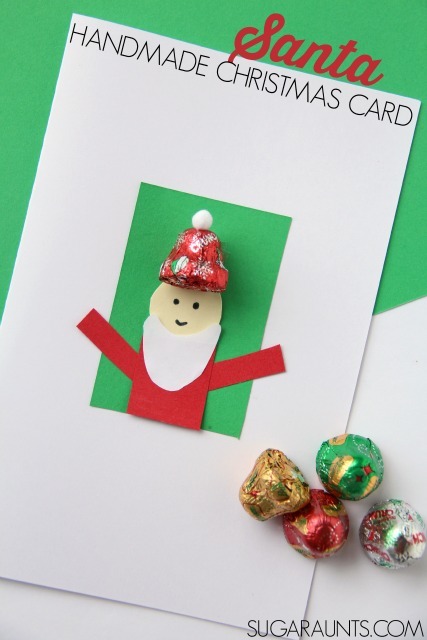 Simply make a "doughnut" of tape and stick the chocolate bell to the card stock above Santa's face. Glue on a white crafting pom pom. You will need an extra tape "doughnut" at the top of the chocolate to keep it propped up strait and to help the chocolate stick. Glue the rectangle onto white card stock. 2 small circles for the reindeer's eyes. 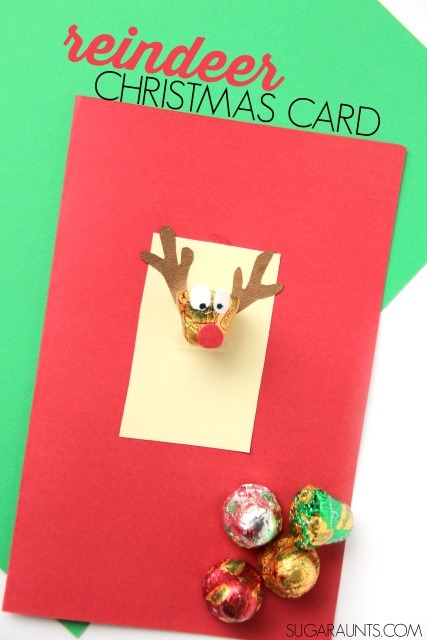 Glue these pieces around a NESTLÉ® BUTTERFINGER® Jingle Bell on a piece of beige card stock. You will need an extra tape "doughnut" at the top of the chocolate to keep it propped up strait and to help the chocolate stick. Glue the rectangle to red card stock, folded into a card shape. Glue these pieces to build the elf. Add a NESTLÉ® BUTTERFINGER® Jingle Bells or NESTLÉ® CRUNCH® Jingles chocolate bell to make the elf's hat. 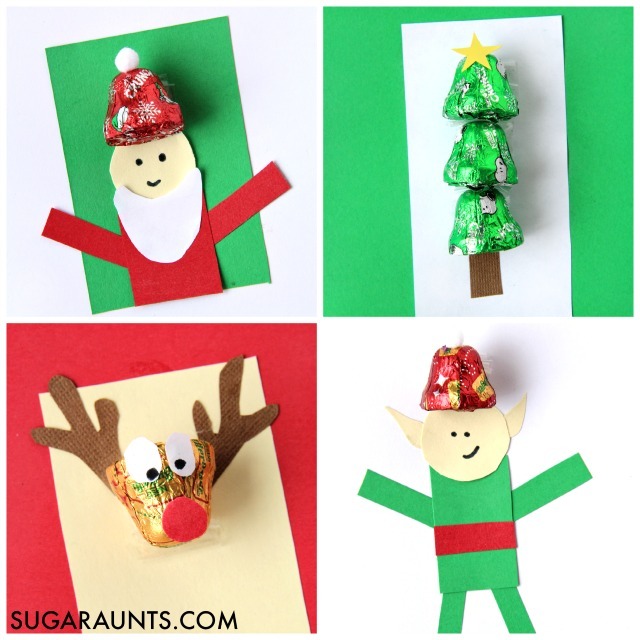 Make a "doughnut" of tape and stick the chocolate bell to the card stock above elf's face. Glue on a white crafting pom pom. You will need an extra tape "doughnut" at the top of the chocolate to keep it propped up strait and to help the chocolate stick. 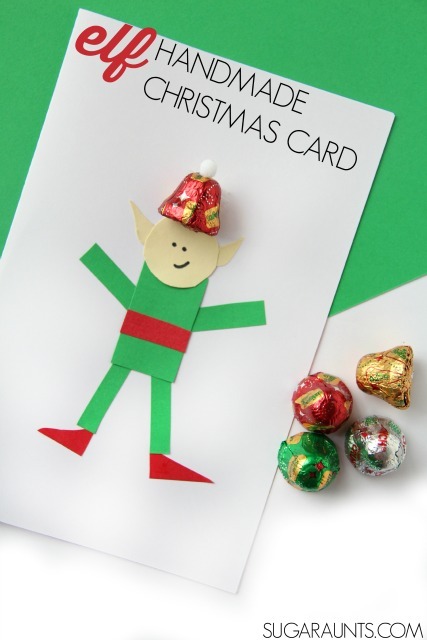 We made our elf right on white card stock folded into a card shape. Use tape "doughnuts" to position three NESTLÉ® CRUNCH® Jingles chocolate bells into a tree shape onto a rectangle of card stock. You may need extra tape to keep the chocolate bells in place. Glue the star at the top of the tree shape and glue the brown trunk at the bottom. 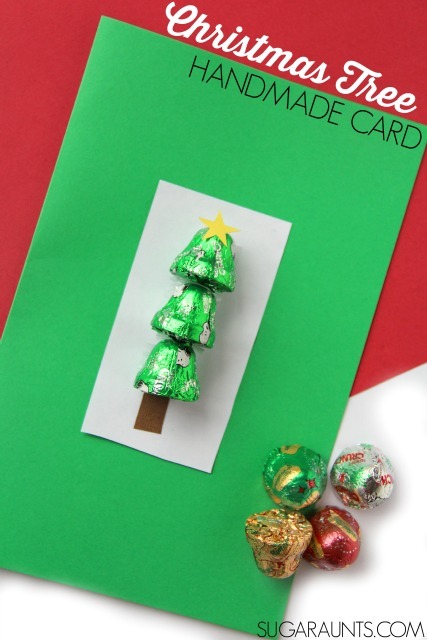 Glue the tree and card stock onto a piece of green card stock folded into a card shape. For all of the cards, crafters can add messages to the inside of the cards with markers and pens. Stock up on the Nestle chocolates because these cards are so cute that you won't want to stop making them! After your party guests have created cards for all of their family and friends, they will want to fill their bellies with a yummy meal. 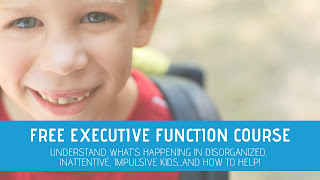 We served STOUFFER'S® Large Family Size Lasagna with Meat Sauce for an easy and good meal. I had a special treat for our party goers after they ate their lasagna...a delicious Dessert Lasagna! 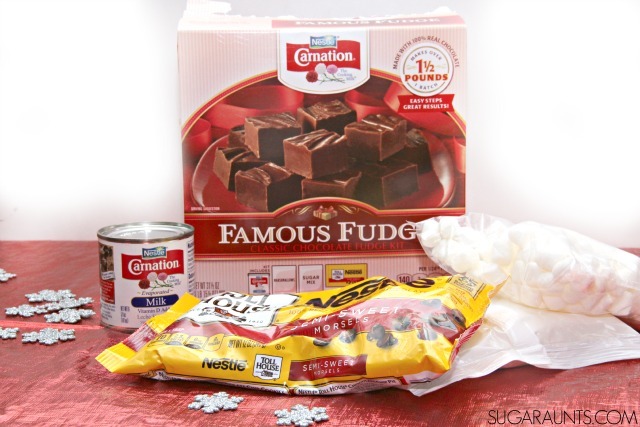 Make the fudge from the NESTLÉ® CARNATION® Famous Fudge Kit as directed on the box, on a 12½ x 17½ by 1 inch Jelly Roll Pan covered in aluminum foil. You want the fudge to be as thin as possible, and using a large jelly roll pan will allow you to do this. Once the fudge has set, turn it over onto a large cutting board. 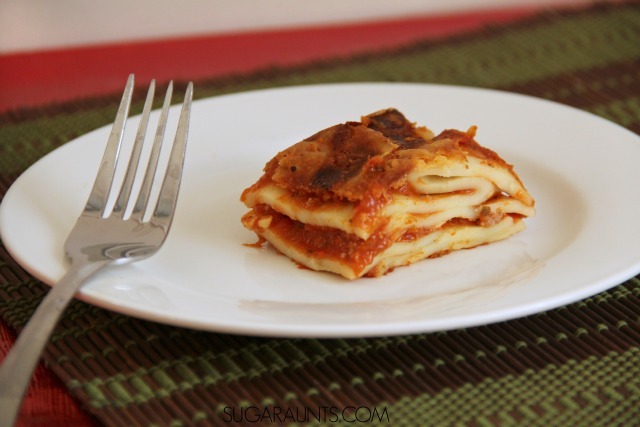 Peel off the aluminum foil and cut into large strips (lasagna noodle sized). 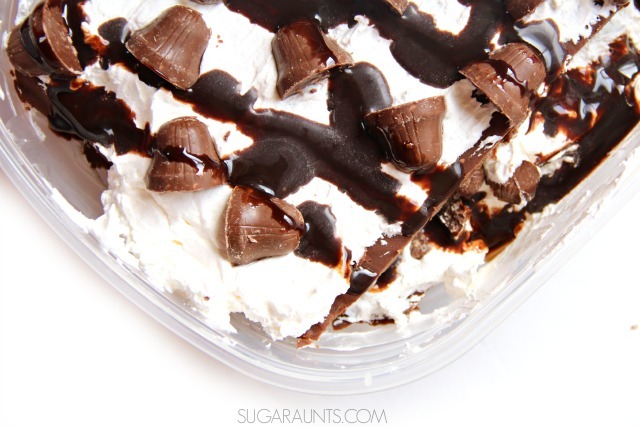 In a 9x9 square pan, layer the fudge, whipped topping, NESTLÉ® CRUNCH® Jingles, and drizzled chocolate sauce. Finish the lasagna with whipped cream topping , halved jingle bells, and chocolate sauce. Chill until ready to serve. Have fun preparing your holiday card making party this year. Whatever holiday get-together this Christmas season brings, fill them with crowd pleasing and easy meals that fit right into your busy life! 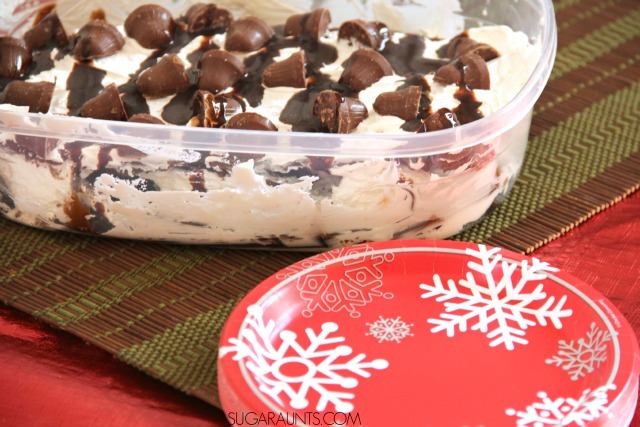 Try our Chocolate Fudge Dessert Lasagna at your holiday parties this year! Your guests will thank you! If you are looking for more delicious recipes this season, stop by and check out the Flavorful Moments Pinterest board. I'd love to hear about how you feed your family during the busy holiday season. Let me know in the comments below!